Elevated and ground-level water storage tanks are an integral part of most water distribution systems. Not only do these vessels ensure adequate hydrostatic pressure and an abundant supply of clean drinking water, but they have also become landmarks for many communities. However, if not properly maintained, they can quickly become liabilities as a result of corrosion-generated leaks and service interruptions. Today, new high-performance waterborne and high solids coating systems are available to help combat corrosion on water storage tanks. In addition to meeting VOC regulations, these new environmentally-friendly coatings offer application and finish quality advantages over their traditional solvent-based counterparts. They form strong mechanical bonds to steel substrates on new tanks, provide superior adhesion to existing coatings on older tanks, and are compatible with cathodic protection. By knowing more about the causes of corrosion on water storage tanks and the characteristics of waterborne and high solids coatings, an economical and effective tank maintenance program can be developed and carried out. 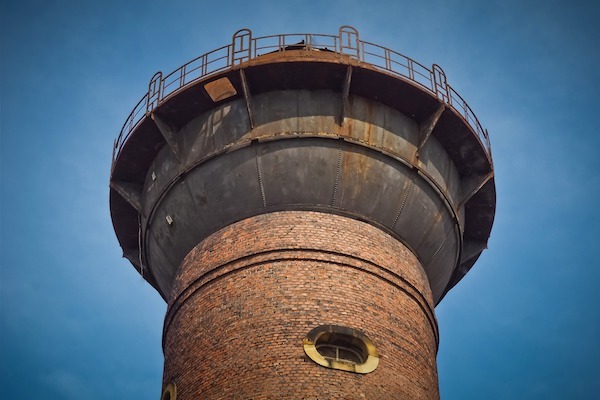 By design, all potable water storage tanks are inherently susceptible to corrosion attack. Selecting the best coating for maintaining a water storage tank begins with an assessment of the corrosive variables present both inside and outside the structure. Corrosion is a natural phenomenon that is based on the laws of chemistry, metallurgy and electricity. In the process of smelting and refining iron ore to produce the steel used in the construction of water storage tanks, energy is added. This results in an imbalance of energy. Nature works to reverse this imbalance by releasing back the energy in the form of electrons, causing the metal to corrode and return to iron oxide, or rust. A helpful comparison can be made between corrosion and a rock being rolled up a hill. For example, as the rock is pushed higher up the hill, more energy is expended. Once the additional energy is removed, the stone begins to roll down the hill and loses energy until it reaches its natural position. In the same way, all metals contain a certain amount of energy and have their own position on the energy hill. In order for corrosion to occur, three elements must be present. They are a metal, an electrolyte, and oxygen. Anode is the name given to the area of higher energy that corrodes, and cathode distinguishes the lower energy area that receives the released energy (electrons). The anode and cathode can be composed of the same alloy, such as steel, and may be part of the same structure, like a water storage tank. In these cases, the metal itself acts as the conductor, and the anodic areas on the steel are those that corrode. Electrolyte is the medium (such as water, moist soil, or concrete) that surrounds the two metals and permits ion transfer and current flow. This element plays a major role in the rate of corrosion activity. An electrolyte with a low conductivity or high electrical resistance produces a slow corrosion reaction, while an electrolyte with a high conductivity and low resistance corrodes rapidly. Because the interior portion of a water tank has a different electrolyte than the exterior, the level of deterioration is not the same in the two areas. On the tank's exterior, corrosion activity fluctuates greatly. At times, deterioration is completely stopped because no electrolyte is present. The composition of the electrolyte is determined primarily by atmospheric conditions. Periods of accelerated corrosion activity result from the existence of water (in its solid, liquid or vapor forms) on the tank's exterior. When chloride or sulfide ions are present, corrosion activity is further intensified, as well as tanks located in industrial or coastal areas. Internally, the steel tank walls are almost completely submerged in water. The water may vary in alkalinity, pH, temperature, dissolved solids and hardness - creating an aggressive environment in the area below the waterline. This same form of corrosion attacks buried pipelines and causes structural degradation of steel reinforced concrete bridges, docks and parking garages. Through the application of protective coatings and cathodic protection, the interior and exterior corrosion of water storage tanks can be effectively controlled. The direct economic benefits include lower operating costs, fewer repairs and an extended design life. However, since potable water tanks face two completely different corrosive environments, the protection method selected for use outside the tank is not necessarily appropriate for mitigating corrosion inside the tank. For the tank's exterior, coatings alone are the accepted protection method. The primary function of a coating is to create a barrier to prevent chemical compounds and moisture from contacting the substrate. While an electrolyte is not always present in this area, preventing water ingress is essential for protection. In addition, the coating must have good adhesion, and chemical and abrasion resistant properties, as well as the ability to withstand ultraviolet radiation. Inside a water storage tank, the approach to corrosion control is different. The strong electrolyte formed by the stored water creates a vehicle for ion transfer and current flow within the micro structure of the steel. However, coatings can be used to interrupt this process and prevent corrosion damage. With a high dielectric strength, the coating restricts the passage of electrons and prevents the metal from going into solution at the anode. If the electrons cannot travel to the cathode, the corrosion process is halted. Proper coating application is essential in immersion environments, such as a tank's interior. Holidays or discontinuities in the coating system expose the metal substrate, causing higher current densities and an accelerated corrosion attack at these points. The discontinuities are often the result of improper surface preparation or poor coating application. While careful application of the coating system can help to reduce the number of discontinuities, cathodic protection has been found to be an economical means of shielding exposed surface areas and extending the coating's life. Cathodic protection works in conjunction with a coating system to prevent metal deterioration. As described earlier, all metals have a natural energy level, and during processing, an unnaturally high electrical potential is transferred to the steel. With the current furnished by a cathodic protection system, the steel can maintain this higher artificial level and remain protected. In its simplest form, cathodic protection furnishes current through sacrificial anodes composed of metals with higher electrical potentials (magnesium or zinc). The anodes are electrically connected to the steel substrate being protected. As the anodes release energy, they will begin to deteriorate, sacrificing themselves for the structure. This is referred to as sacrificial or galvanic cathodic protection. For potable water storage tanks, impressed current cathodic protection is the most common method employed. With this type of system, current is delivered from a DC power supply connected to relatively inert electrodes or anodes. Current is forced to flow from the electrode, through the electrolyte, to the metal surface. The major benefit of this type of cathodic protection system is the ability to adjust voltage levels for changing water chemistries and surface conditions. These adjustments can be made automatically through computer-controlled rectifier units. The relationship between cathodic protection and coatings inside a water storage tank is symbiotic. While cathodic protection mitigates corrosion at pinholes, voids and holidays, the coating electrically insulates most of the tank's interior, allowing the cathodic protection system to operate at a much lower voltage level. The synergy generated from the two systems was confirmed in a four-year study by the U.S. Navy that found cathodic protection could double or even triple the time between recoatings. However, to achieve this kind of performance, the cathodic protection system has to be monitored and properly adjusted to ensure it delivers just enough current for polarization as recommended by the standard AWWA D104-91. Over protection caused by excessive current output can lead to coating disbondment, blistering and, ultimately, complete coating failure. With the enactment of regulations limiting VOC emissions of industrial maintenance coatings, a whole new breed of protective coating systems is available for corrosion control of potable water storage tanks. These new systems include waterborne epoxies, acrylics, mastics and high-solids epoxies and urethanes. Some of these coatings are better for new tank applications, while others exhibit superior adhesion to existing finishes. Are these coatings as good as the traditional high solvent based products? The answer is yes for many of the coatings now on the market. In fact, new polymers and additives that make up these coatings allow for easier application, a wider range of acceptable application environments and an improved finish appearance. The key to achieving effective corrosion control is specifying the coating system with the right properties for the site-specific tank conditions. DTM (Direct to Metal) Acrylics - Single component waterborne coatings like direct-to-metal acrylics have become increasingly popular for protecting tank exteriors. Their broad spectrum of performance capabilities, ease of application and general economy has made them the right choice for many water authorities. Polymers based on acrylic chemistry have proven application advantages. These include good durability, exceptional resistance to ultraviolet light (UV) and long-term flexibility. With the addition of co-monomers like styrene and acrylonitrile, acrylic coatings offer superior chemical and corrosion resistance. In addition, they possess excellent appearance characteristics because they have the rheology or flow properties of a liquid system without the high solvent content. Acrylics are available for use as primers or topcoats on tank exteriors, and are an attractive alternative to alkyd and polyurethane finishes. Waterborne Epoxies -Water-borne epoxies provide the convenience of a water-based coating, with the performance qualities of conventional solvent-based systems. Through the crosslinking of waterborne polymers with monomers containing hydroxyl or carboxyl groups, these coatings are able to form tight, dense films for greater adhesion and corrosion protection. They are highly acid, alkali and moisture resistant, and can withstand heavy abrasion. Waterborne epoxies dry quickly to prevent wash-off due to rain or dew. With the addition of sodium nitrite, these epoxies also resist early or flash rusting. High-Solids Epoxy Mastics -Epoxy mastics offer a high degree of resistance to acids, salts, chemicals and moisture, making them a good barrier coating for tank exteriors. Because they are compatible with old, intact paint films and provide adhesion over dry, marginally prepared substrates, they require minimal surface preparation. Typically the coatings are applied to previously coated tanks as a primer coat. For tanks with lead-based alkyd finishes, these coatings provide a good base coat that prevents lifting for effective overcoating of hazardous lead particles. High-Solids Polyurethanes -For many years, lead-based alkyds were the most popular coating for water storage tank exteriors. After lead-based paints were banned, polyurethanes quickly became the coating of choice. Now, with limits on VOC emissions, high-solids polyurethanes have become the most widely used exterior coating product. This use can be attributed to the extreme versatility of these coatings. Polyurethanes can be either hard and rigid or soft and flexible. They are also hydrolytically stable and resistant to a variety of solvents and chemicals. However, the coatings' most notable property is their abrasion and impact strength. This helps to prevent exposure of the substrate caused by mechanical damage, and the creation of galvanic corrosion cells. In addition, polyurethanes have excellent color and gloss retention over long periods of time and in all types of environments. Today's new polyurethanes have reduced viscosities so that less solvent is required. These new finishes are formulated to achieve VOC contents of between 2.8 and 3.5 lbs./gal. and, along with environmental compliance, deliver a high-build finish without sagging. One and two-component polyurethanes are applied to tank exteriors primarily as a topcoat over epoxies. For applications in cold, damp environments, moisture-cured polyurethanes are available. High Solids Epoxies - There are few coating types that can meet both the toxicological and extraction test requirements of ANSI/NSF Standard 61 and the long-term corrosion protection needs of potable water storage tanks. Among the two most effective, vinyls and epoxies, only high solids epoxies have been formulated to acceptable VOC emission levels. As a result, high solids epoxies are specified for the overwhelming majority of immersion service applications on potable water storage tanks. Blistering of a protective coating is considered the most common mode of failure in immersion service. When a lining blisters, its ability to provide corrosion resistance is greatly diminished. If cathodic protection is employed and not properly monitored, voltage levels can far exceed what is necessary for polarization. This causes high concentrations of hydroxyl ions to form under the paint film. The subsequent osmotic influx of water through the film leads to accelerated delaminations and blistering. Along with complying with environmental regulation, new high solids epoxies offer a number of application and performance advantages. Their lower molecular weights create smaller, lower viscosity molecules. As a result, crosslink density is increased for greater chemical and moisture resistance and better adhesion. Today's high solids epoxies are also more user-friendly. Their unique chemical compositions allow for enhanced flow and leveling characteristics and the creation of higher builds. The protective films contain a lower percentage of pinholes and voids. This is particularly important in applications where cathodic protection is used. Since high solids epoxies have proven to work well with cathodic protection systems, some coating manufacturers have even gone so far as incorporating cathodic protection test methods in their product development programs. Few, however, identify their coatings as being compatible with cathodic protection. When the EPA declared war on airborne pollutants, many in the water industry feared that alternative environmentally acceptable coating systems would fall short of the corrosion protection capabilities of tried and tested high solvent based products. This misconception has been put to rest with the introduction of waterborne and high solids coating systems. These new systems not only provide comparable corrosion protection, but also offer numerous other benefits. By carefully examining the properties of the new coatings and specifying the right product for a particular application, water authorities can create a more economical and effective tank maintenance program. Dallas Finch is the Director of Industrial and Marine Coatings with The Sherwin-Williams Company.